The David Naill DN6 bagpipe is the premiere set in the David Naill range. It is both majestic and powerful, showcasing the best craftsmanship and metalwork the company offers. These are top of the linepipes, fully mounted with hand engraved Sterling Silver. We exclusively use .925 Sterling Silver for this model. 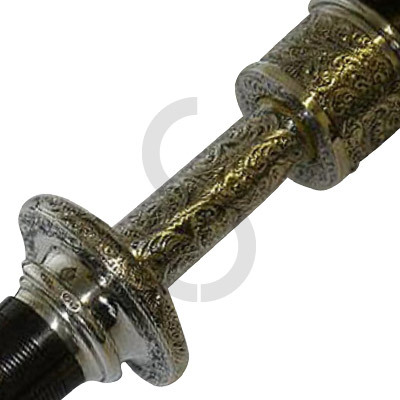 Included are full Silver mouthpiece and chanter sole – both made from a solid piece. Projecting mounts are made from thick walled castings which are machined and then turned by hand to finish – they are not filled. The weight of the Sterling Silver on this set is approximately 1.35 kgs/2.98 lbs. Everything about this set is of the highest quality, and the hand-cut Silverwork is superb. The engraving creates fantastic aesthetic detail and comes in a variety of designs. Accessories include David Naill African Blackwood pipe chanter, synthetic pipe bag, synthetic drone reeds, silk cords and your choice of Corduroy or Velvet pipe bag cover. All David Naill bagpipe parts are accompanied by a 2-year manufacturer’s warranty. African Blackwood (Dalbergia Melanoxylon) was listed in Convention of International Trade for Endangered Species (CITES) Appendix II on 2 January, 2017. Sales and transfers of African Blackwood bagpipes to non-EU countries will be subject to the issuance of a CITES export license at additional cost subject to an approximate 14-day application process. The customer is also required to obtain a CITES import license from their own country’s CITES agency. All non-EU customers must contact us prior to making a purchase. All David Naill bagpipes are manufactured to order subject to demand. Please allow approximately 4 to 6 weeks for production and delivery following payment.